BETHEL – Ricky Vandegrift will end his summer by competing for a world rowing championship in Amsterdam. The trip to the Netherlands is just the latest step in the 17-year-old Bethel native’s long journey, which has seen him overcome a physical challenge to become one of the world’s elite athletes. Vandegrift was born without a fibula in his left leg, which hindered the growth and ability of his left foot. At 18 months old, his leg was amputated below the knee, and he was fitted with his first prosthesis. Growing up on East Fork Lake, he was always active and enjoyed hunting, fishing and hiking. It was clear early on that Ricky was not going to let his disability define him or his athletic opportunities. Vandegrift, who is one of six children homeschooled by their mother, Janet, began playing ultimate Frisbee six years ago. 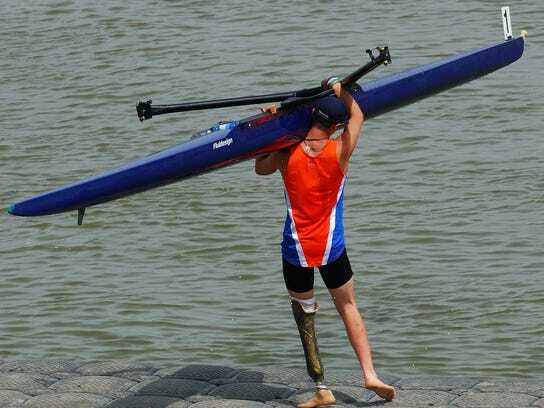 That sport challenged his stamina and the stability of his prosthetic foot. The stamina was no problem, but the foot kept breaking. His father, Richard, an engineer, worked with Shriners Hospital in Lexington to develop a more flexible prosthesis. Most prosthetic lower legs have a fixed ankle to ensure stability, but most wearers of prostheses aren’t highly competitive ultimate Frisbee players or rowers. Now, Ricky has a foot that he can stretch into the shoes built into his boat. Ricky began rowing three years ago, first with the Clermont Crew, then with the Cincinnati Junior Rowing Club. 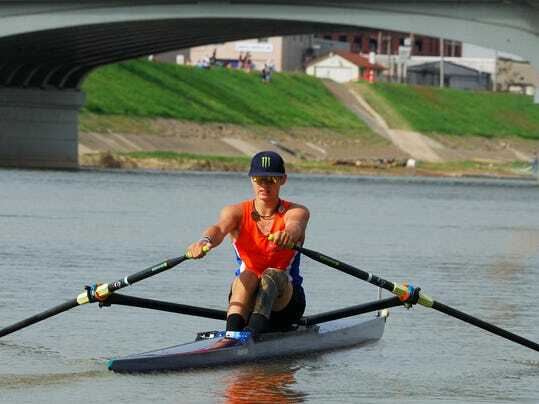 A series of fortunate events led to his qualification for the World Rowing Championship beginning on Aug. 24. His father took him on a tour of a rowing machine factory in Vermont. There, the engineer giving the tour notified the Vandegrifts about the national team and the opportunity to compete on machines. “There have been a lot of people along the way who have helped with this opportunity,” said Richard. After lowering his machine time to 3:10, Vandegrift was one of six men and six women to advance to the national team tryouts in Boston. From there, he became one of the two men and two women to make the team. He will return to Boston in mid-July to train. The Clermont Crew team has embraced Ricky and allowed him to continue training with the team on East Fork Lake. Next story USRowing event expected to produce financial gains!